Schizandra is the only herb that contains all five flavors. The very name of Schizandra in Chinese, Wu Wei Zi, means "Five Flavors Fruit." Schizandra has earned a reputation as the "quintessential tonic herb" because it can benefit all five primary organs and nurtures all five Elemental Energies of the human body in Traditional Chinese Medicine (TCM): Wood (Liver), Fire (Heart), Earth(Spleen), Metal (Lungs) and Water (Kidneys). 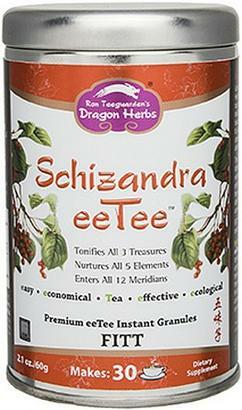 Schizandra can be consumed daily throughout one's lifetime as an anti-aging herb and to promote longevity. Ingredients: Northern Schizandra fruit, maltodextrin (A bidning agent, enzymatically delivered from plant starch. May contain a trace amount of corn or wheat). Usage: Add 1 teaspoon (2g) of Schizandra eeTee™ powder to 6oz. of water, hot or room temperature, stir or shake until the powder completely dissolves. For iced tea, use room temperature water to dissolve the powder first then add ice. You may flavor the tea with sweeteners, fruits, or herbal tinctures. You may also adjust the amount of Schizandra eeTee™ to your liking. 1-4 servings per day. Northern schizandra fruit, maltodextrin (a bidning agent, enzymatically delivered from plant starch. may contain a trace amount of corn or wheat). 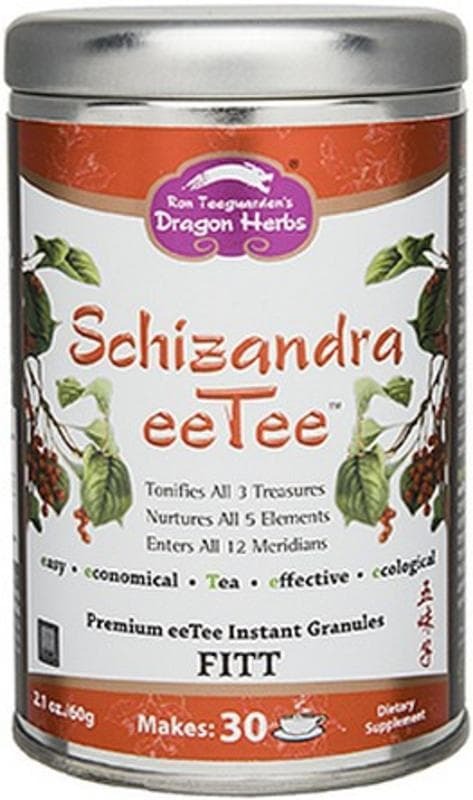 Add 1 teaspoon (2g) of Schizandra eeTee powder to 6oz. of water, hot or room temperature, stir or shake until the powder completely dissolves. For iced tea, use room temperature water to dissolve the powder first then add ice. You may flavor the tea with sweeteners, fruits, or herbal tinctures. You may also adjust the amount of Schizandra eeTee to your liking. 1-4 servings per day. 60 gm, 2 gm per serving, 30 servings.